Blockbuster producer Jerry Bruckheimer ups the disaster movie ante by envisaging the destruction of the entire earth by an asteroid the size of Texas. 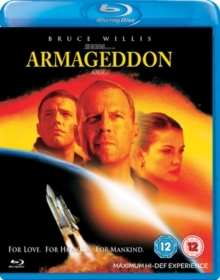 NASA's attempt to avert global catastrophe involves sending a motley crew of oil drillers, led by Harry Stamper (Bruce Willis), into space, where they will drop a nuclear bomb into the asteroid's core. Amongst Stamper's team is A.J. (Ben Affleck), the headstrong suitor of his daughter (Liv Tyler), who waits on earth alongside NASA chief Dan Truman (Billy Bob Thornton) for news of the mission's success.